Naomi Amos and Noémi Lee, adjunct instructors in music, will perform a four-hand piano recital at 7 p.m. Sept. 5 in Sydnor Performance Hall. They will play selections by Sergei Rachmaninoff, Antonin Dvorak, Claude Debussy and Johannes Brahms. 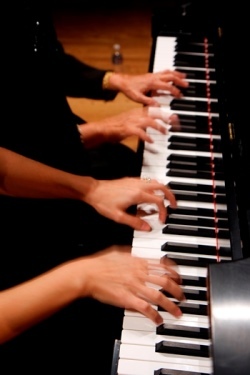 A four-hand recital is performed on one piano. Learn more about the performance in this Critograph article.